Carlos Gomez joined the Army as an Infantryman when he was 20, wanting to provide a better life for his then five-year-old son, Aaron. He deployed to Afghanistan in 2011 with the 6th Squadron, 4th Cavalry Regiment, 1st Infantry Division. Three months into the deployment, SPC Gomez’s squad was returning from a routine patrol in Khost Province when his vehicle drove over a 600-pound improvised explosive device (IED), ejecting him from the vehicle and rendering him unconscious throughout his medical evacuation. When he woke, he learned that his best friend had been killed in the blast, and that he had sustained severe injuries to his right leg, right hand, and back. Once he arrived in the United States, Carlos’ right leg was amputated above the knee; doctors also fused his spine. Now medically retired, Carlos still maintains an active lifestyle. He enjoys mountain climbing, SCUBA diving, dirt biking, and cross country skiing. “I’m very positive and am always eager to give life another try,” he says. Carlos drives 50 miles every day to his job with the Army Corps of Engineers to provide for his two sons. He often experiences severe phantom pain but chooses to work through it so he will not lose wages that his family depends on. Receiving a mortgage-free, specially adapted Homes For Our Troops home will alleviate much of this strain and financial worry in his life. “By receiving this free home, I will be able to invest more time into my children’s lives and importantly, my healthcare,” he says. The home’s accessible bathroom will make showering easier and safer for Carlos. The lower counters and pull-down shelves in the kitchen will allow Carlos to cook and prepare meals for his two sons. Carlos would like to complete his college education and volunteer at homeless shelters. 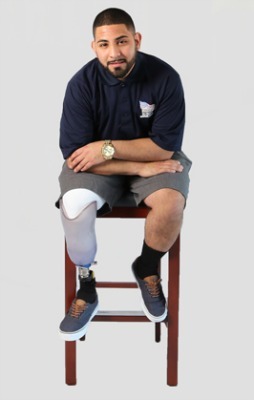 He enjoys delivering motivational speeches to other newly injured Servicemembers, and helping them come to terms with and accept their new bodies. Living in a mortgage-free home will allow him to focus on these goals, and on being a great father and role model to his boys. Carlos describes himself as a fighter and says raising his sons is his top priority. He wants HFOT’s donors and supporters to know this home will be beneficial for his future. “Knowing that I have no mortgage will allow me to relax and be there for my two boys who need me the most,” he says. Community Kickoff held on Jan. 26, 2019.